It is Rome and they do not have enough drinking water. Master builders oversee their workers as they build the necessary aquaducts to bring the people the water they need. 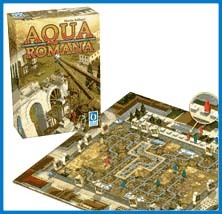 The winner will be they player who best manages his workers to build the longest and most effective aquaducts in all of Rome!